Here we are, the second "Species Highlight's" post! I hope everyone enjoys it (this is an addition to the other species highlights. Look to the left and click "Species Highlights" under the Labels function! Coenobita compressus, or the Ecuadorian land hermit crab, comes mainly from the western coast of South America, making itself at home in countries like Ecuador and Chile. They are mostly beach-dwelling hermit crabs, who stay on the beach and walk around in large colonies of over 100. Ecuadorian land hermit crabs are the smallest species of land hermit crab that is known to enthusiasts. They are known for their blue tint and also their small size. Ecuadorian land hermit crabs will usually not wear turbo shells, but instead will attire themselves into something more comfortable with a “D” shaped opening. 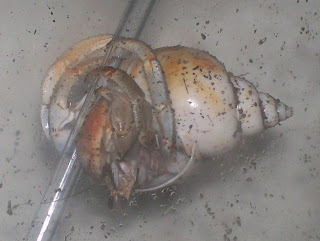 Another difference that these types of land hermit crabs have towards the others are that they are unusually fast. 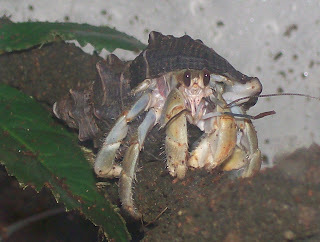 Although other land hermit crabs can be somewhat sluggish in their movements, Ecuadorian land hermit crabs have the capability to run much faster. This may result from living on an open beach without much cover. 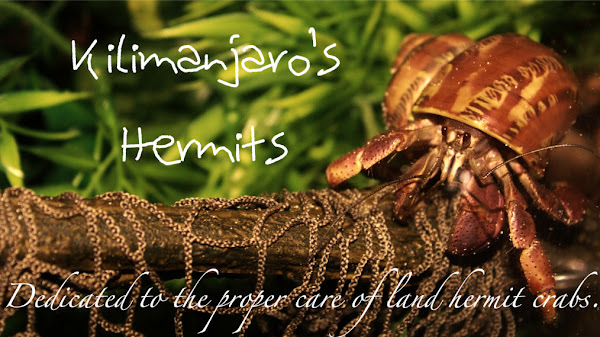 Ecuadorian land hermit crabs are used to warm temperatures and a high humidity level, so this is a must when you keep these types of hermit crabs. Additionally, because they live so close to a beach, a good supply of saltwater should be readily available for your Coenobita compressus to drink and use. You can identify these crabs by looking at their color differences compared to the other species. Additionally, the eyestalks of this land hermit crab appear to have a candy corn shape. I always thought of them as little bubbles that look like they are going to burst at any moment. 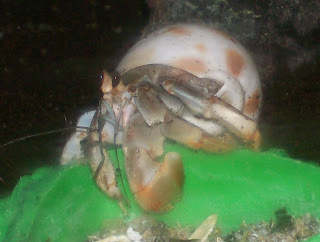 Finally, I’ve had Ecuadorian land hermit crabs for more than one year. 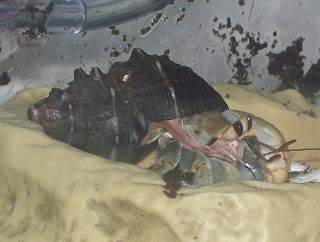 They are a pretty hardy species and get along well with the other types of crabs. They dig often and are a very exciting species to watch because of their high activity level.